Hurricane Florence hit the Carolinas and Virginia hard last week, with a current death toll of 37 and it’s still rising. There are still people without power, and recovery is going to take a while. I noticed a few companies that really stepped up during this tragedy, but I want to tread lightly here. If companies choose to be on-site after a disaster, they should take every precaution to guarantee the safety of their people. Nevertheless, these companies went above and beyond to help the community. Duracell launched the PowerForward program in 2011. This fleet of specially designed vehicles go out during and after natural disasters to donate batteries and provide charging stations and free WIFI to affected areas. Their vehicles are equipped for different types of disasters, including hurricanes, flooding, snow storms, landslides, tornadoes, and more. This is the better of the two I’m reviewing, because they are well equipped and prepared. They claim to be strategically staged so that one of their trucks can reach any point in the US in 24 hours. 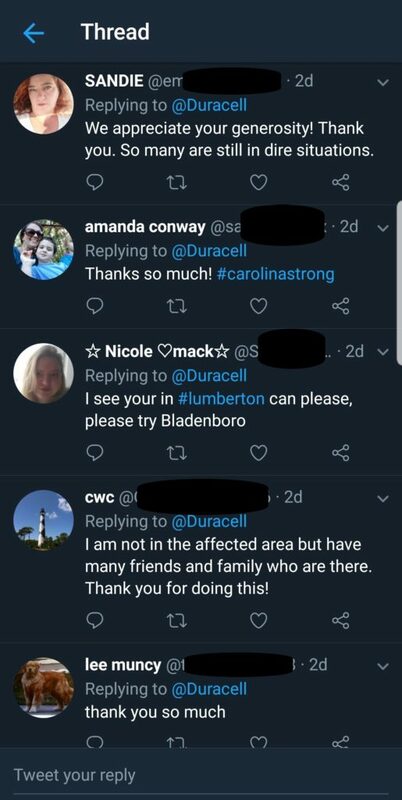 Duracell showed up in the Carolinas, providing their services and handing out batteries, and people were extremely grateful. This is perhaps the most controversial of the bunch, because for a Waffle House to be open during or immediately following a disaster, it requires their employees to come in and work, while their employees are some of the folks hit by the disaster. I don’t know the details of how they manage this, but I know it is a likely issue. I’m not ignoring that. That being said, Waffle House is synonymous with being open 24/7. When asked how they start preparing for a disaster like Florence, the CEO joked that they first had to find where the key to the front door is. They actually have a hurricane center to evaluate which stores will close and when! FEMA even has a “Waffle House Index” it uses to evaluate which communities might need more aid. To top it all off, the CEO himself was there on the ground in the Carolinas as one of the Waffle Houses there opened back up to serve first responders and the community. Depending on your industry, you may not be suited to be on the front lines of a disaster. So what can you do to help (and maybe get a little positive exposure)? Whether it is a one-time social event that you advertise and drive engagement in exchange for donations to a charity, or a longer-term agreement to donate a portion of sales to a charity, this will set you apart from your competition and help you sleep a little better at night knowing you’re making a difference. It also helps with appeal to millennial audiences. With all other things being equal, they are likely to be drawn to a company with a conscience. Especially if disaster strikes your community, look for an opportunity to donate your goods or services to the people affected. Be sure to pay attention to what people actually need and try to find recommended donations by a charity already serving in the area. Take a day (or longer if possible) and go volunteer helping your community clean up. Get connected with a charity and work alongside them as they have more structure and organization than you trying to do things on your own. During the time you dedicate to the charity, be present. Be the best help you can be. Pay attention to the real needs and do what you can to fill them. As you inevitably post about it, be humble. Don’t just brag on yourself. Give credit to the people organizing the charity or recovery efforts. Draw attention to the continued needs that still need to be filled.